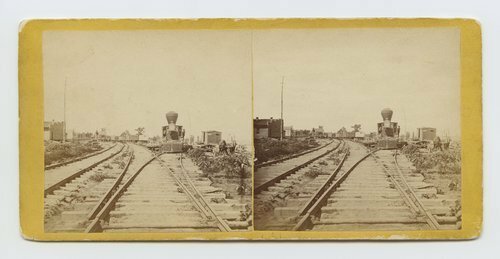 This stereograph shows the railroad shops at Wyandotte, Kansas. A locomotive and railroad tracks and cars are visible in the photograph. It is from Alexander Gardner's series, Across the Continent on the Union Pacific Railway, Eastern Division.